Summary: Alexandria Prep is hacked in this whodunit set in the age of social media and the cloud. One of my favorite things about reading is when a book proves me and my first impression completely wrong. When I first started Antisocial, I wasn't sure if it was my kind of read. Don't get me wrong, I'm always open to trying something new when it comes to books, especially with a premise as intriguing as this one. But lately I’ve been reading more adult books, usually fantasy or mystery or paranormal or things of that sort. Realistic fiction, especially those set in high school, aren't my typical reads as of late. But I am incredibly grateful that I picked this one up. It's another one of those books that proves that genre isn't everything. Antisocial has so much more to offer than just a high school story. It's full of heart and mystery and humor and, most importantly, incredibly lovable characters. I couldn't decide at first if I was really connecting with Anna. I liked her, I related to her, she was a very enjoyable character to me from the start; but it wasn't one of those immediate, obvious connections. But when I closed the book, I missed her. It made me realize that sometimes you don't have to connect with a character on every level or agree with everything they say and do. Sometimes certain characters are just good company, they're like friends. And that's what Anna was to me. Anna was such an interesting character and one that I couldn't help but root for and relate to. Her anxiety is a big part of the story, and I am so grateful that the author didn't shy away from it. I liked that Anna's anxiety was written in a light of acceptance and of healing and that, through her anxiety, she was able to understand and attempt to help someone else. I really appreciate when authors touch on mental health and spread awareness not just about the problem itself but also about the fact that it doesn't have to define us. Anna, with the help of her loved ones, took care of herself and used her situation in a positive way later in the story. This is something that made me like Anna from the beginning and made me extremely proud of her and of the author's portrayal of her. I also feel the need to defend Anna a bit, however. As much as I like her and feel for her, I can admit that she did make mistakes. As did almost everyone at some point among the pages of this book. But a couple of my fellow reading friends (who are okay with my mentioning them in this review – hi, guys) were particularly hard on Anna for how she treated her friends, calling her vapid or self-centered. It's true that what Anna did was wrong; and if she had never admitted that or apologized for it or tried to make things right, I would completely agree that she was vapid and cruel and not a very good person or friend. But the thing is she did admit it. She even knew deep down at the time that it was wrong, but she was in a strange place at the time and was blinded by what she thought was first love. Those aren't excuses, and Anna doesn't use them as such; but considering she did apologize and own up to it, I think she deserves a little more forgiveness from the reader. And as far as her being self-centered, Anna did have to think about herself at times, but I don't believe that makes her self-centered. It makes her human. She makes unbelievable effort to do right by those around her, by her friends, and to make up for the mistakes she made. She's not perfect, but she tries. And to me, that's the most important thing a person can do. Another character that I feel very strongly about is Jethro. He, like Anna, made mistakes and was not perfect. But Jethro has such a big heart and cares so much for those around him, especially Anna; and we all know what it's like to have the best intentions and completely go about them the wrong way, so I felt for Jethro and I'm really happy with how things ended between him and Anna, though some readers may want a bit more closure. But I'm content with having my own opinion of how things played out after the last page. The author did a great job establishing Anna and Jethro's relationship and how much they mean to each other, so I enjoyed some things being left up to the reader and not all wrapped up in a neat, perfect happily ever after. I also felt that it was a fitting end to the story itself, a reminder that not everything always has a perfect, pretty ending. Our lives don't come to a perfect close after one story, they're full of stories, one after the other, and this was just one of Anna and Jethro's. There were plenty of other supporting characters to love in this book, such as Nikki and Haven and even Palmer. I felt he was misunderstood and deserved so much more; he broke my heart, and I truly came to love his character. A certain part in the book involving him absolutely gutted me and left me shocked. I commend the author for that amazing yet devastating twist; I never saw it coming. This entire story is full of intrigue and mystery, though with a much lighter tone than what I've been used to lately. But it really worked; I was never bored or unsatisfied with the action, and I couldn't wait to see what happened next. All in all, I truly enjoyed this book and am beyond impressed that it is Jillian Blake's debut. There were so many moving parts and so many things and people to suspect; the concept of this story was amazing, and it was executed wonderfully. I also adored the ending; the message of this book is incredibly important, and I'm so glad that I read this one. 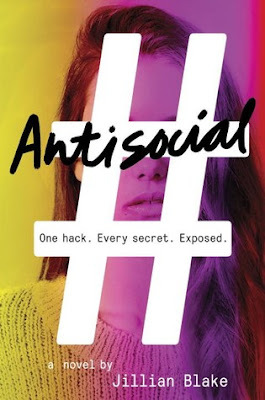 I highly recommend Antisocial to fans of teen/YA suspense and any reader that enjoys books that make you stop and think. I know I'll be thinking about this one for a long time. I'm so glad to hear that, Vanessa! I think you'll really enjoy this one if you read it :-) Thank you so much! The limnited closure is the thing with YA contemporary and it drives me bananas. Other than that this sounds like a good read and I like that it handles tough topics realistically. Great review! I don't always read a lot of contemporaries either but every once in a while one comes along that just works. And glad to hear that you were able to connect so well with the MC! An author is doing something right when they can make that happen. Also, the ending. While I like a good HEA you're right life doesn't always wrap things up in a nice bow, and leaving a little to the readers imagination can be a good thing. Sounds like a great read! Nice review. This is such an articulate and thoughtful review, Mckenzie! And thank you for putting this book on my radar, it definitely sounds like my tye of read. What a MAGNIFICENT review, Mckenzie!! KUDOS to you, girl!!! I enjoyed reading your detailed description of how the characters affected you, And I ESPECIALLY liked that you judged Anna with fairness and compassion. It's SO true -- if someone is willing to admit that they messed up, and tries to make amends, then they definitely deserve to be given a break. The subject matter of this book is very appropriate to the age of social media. As I commented on a similar book reviewed here not that long ago, I think people just share TOO much on social media. They open themselves up to hacking! I can understand that people want to share family and vacation pics, as well as events, but still. You make me want to find out more about Anna and Jethro's relationship, Mckenzie! And you're SO right, life doesn't give us happy, pretty endings, at least, not all the time. Aww, thank you SO much, Maria!! I agree; we're all human and we all mess up from time to time. If someone's truly sorry, they deserve another chance. And Anna definitely deserved another one, as well as Jethro. I agree! At times it seems like people share their whole lives on social media without a second thought, and it makes me a bit nervous. It's such a dangerous world.